On Wednesday, November 6, 2013, after the general audience in St. Peter's Square, Pope Francis stopped to greet some couples who had been married that day. 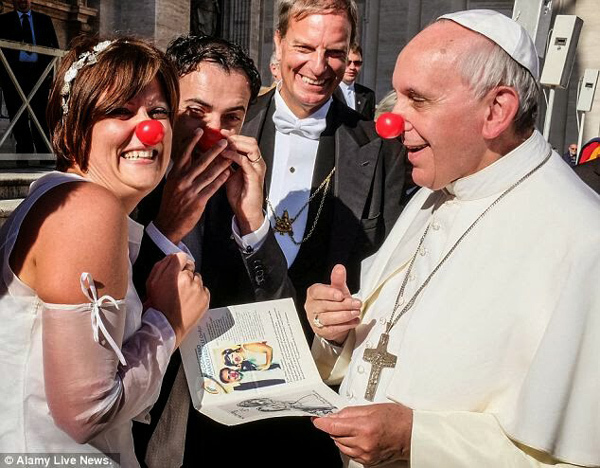 One of those couples offered him a clown's red nose, which the Pontiff put on for some moments, as shown above. This gesture, which unfortunately brings the Papacy to a new degree of degradation, has however, one small advantage. It spells out a tendency that has marked the pontificate of Jorge Bergoglio since the first day. It is his inclination to be a buffoon. We can see that he was on a psychological quest to find himself, which today reached its final term. 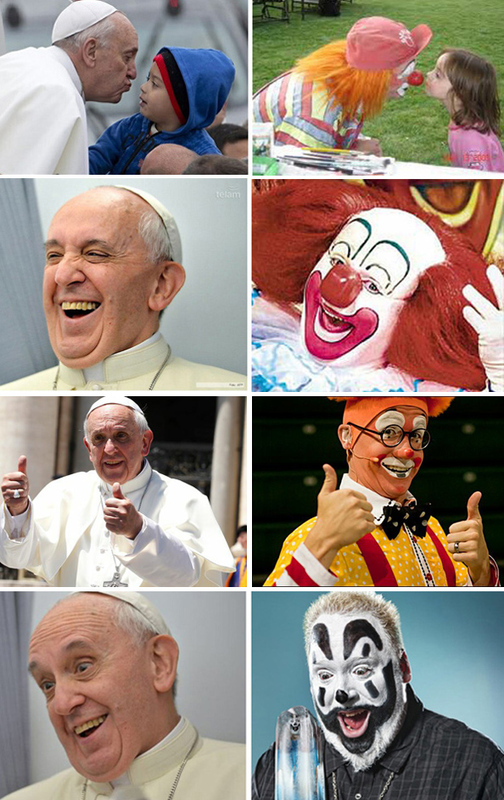 Now we can see that Pope Francis found his self identity. He is a buffoon and accepts it joyfully. Given this public gesture, we see no reason why we should not call him a name that he chose for himself. 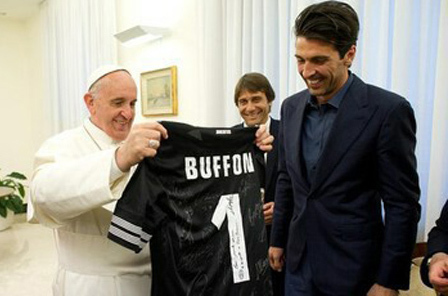 Months ago, on May 23, 2013, he received a soccer shirt with the name Buffon 1 written on it. Although it may be the name of some athlete, the spelling is quite close to buffone in Italian, bufón in Spanish or buffoon in English. 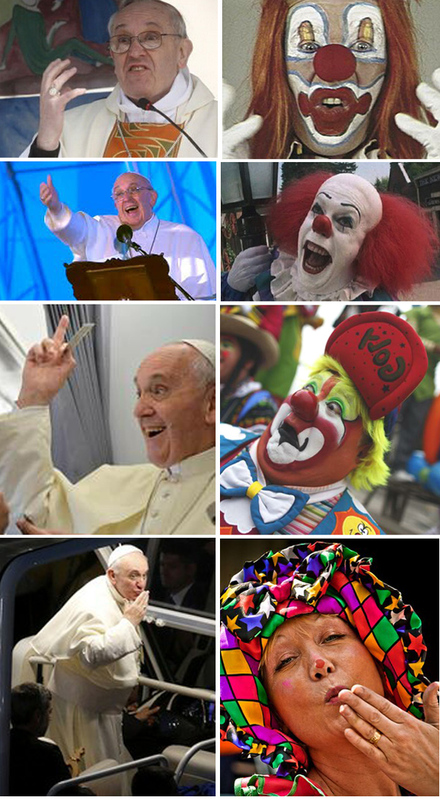 It was an ambiguous homage to Francis insinuating that he is a clown. He received the shirt jovially, first row below. With the recent gesture, what was implicit then became explicit. 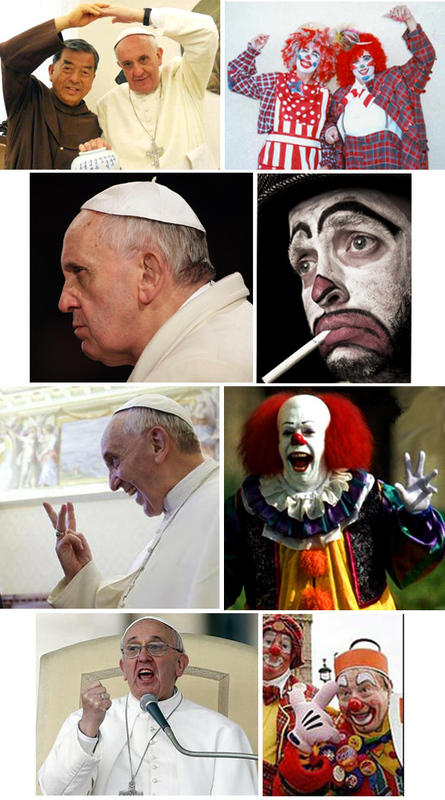 From the second row to the end, we show how many of the grimaces and gestures Francis habitually makes are characteristic of clowns. These photo comparisons may help our readers to see how this has been a long process. Another question, which will not be addressed here, is to know what it means for the Catholic Church to have a man who acts and appears like a buffoon as her Pope.